Spinal muscular atrophy (SMA) results from insufficient levels of the survival motor neuron (SMN) protein. Drosophila is conducive to large-scale genetic-modifier screens which can reveal novel pathways underpinning the disease mechanism. We tested the ability of a large collection of genomic deletions to enhance SMN-dependent lethality. To test our design, we asked whether our study can identify loci containing genes identified in previous genetic screens. Our objective was to find a common link between genes flagged in independent screens, which would allow us to expose novel functions for SMN in vivo. Out of 128 chromosome deficiency lines, 12 (9.4%) were found to consistently depress adult viability when crossed to SMN loss-of-function heterozygotes. In their majority, the enhancing deletions harboured genes that were previously identified as genetic modifiers, hence, validating the design of the screen. Importantly, gene overlap allowed us to flag genes with a role in post-transcriptional regulation of mRNAs that are crucial for determining the axes of the oocyte and future embryo. We find that SMN is also required for the correct localisation of gurken and oskar mRNAs in oocytes. These findings extend the role of SMN in oogenesis by identifying a key requirement for mRNA trafficking. Spinal muscular atrophy (SMA) is a motor neuron disease caused by homozygous mutations in the survival motor neuron 1 (SMN1) gene that are partially compensated by the paralogous SMN2 gene. SMA patients have insufficient levels of the SMN protein, a situation triggering lower motor neuron degeneration and profound muscle weakness that restricts mobility and, in severe cases, results in respiratory failure and death . SMN operates as part of a large multiprotein complex whose constituents also include Gemins 2–8 and Unrip . The SMN complex is known to chaperone the assembly of ribonucleoproteins (RNPs) including small nuclear RNPs (snRNPs), which form the core components of the spliceosome , and messenger RNPs (mRNPs), which ensure transport as well as cytosolic localisation of mRNAs . Whether either or both RNP assembly reactions are perturbed in SMA remains unclear. Animal models including the fruit fly Drosophila melanogaster are key for exploring the in vivo function of the SMN protein (reviewed in ). To this end, SMA-causing missense mutations (SMN 73Ao ) or deletion of the fly SMN gene orthologue leads to motor dysfunction in addition to defective neuromuscular junction (NMJ) morphology and transmission [6–8]. Drosophila is conducive to large-scale genetic-modifier screens which can potentially reveal novel pathways involved in the disease mechanism. The first Drosophila SMN genetic screen assessed whether a collection of transposon-induced mutations either enhanced or suppressed the lethality of SMN 73Ao heterozygotes and homozygotes, respectively. The identified modifier genes had no obvious role in RNP assembly with some including components of the bone morphogenetic protein (BMP) and fibroblast growth factor (FGF) signalling pathway [7, 9]. In a later study, the same lab performed a complementary screen this time using a hypomorphic SMN RNAi allele to increase sensitivity. A larger number of candidate genes that function in various pathways including RNA metabolism were successfully discovered . Aiming at performing an independent SMN genetic screen, we tested the ability of a large collection of genomic deletions to reduce the viability of SMN 73Ao heterozygotes. To test our design, we asked whether our study can expose genomic regions containing genes identified in previous genetic screens. Finally, by exploring a common link between genes flagged in independent screens, we expose a function for SMN in post-transcriptional mRNA regulation in vivo. Flies were cultured on standard molasses/maizemeal and agar medium in plastic vials at an incubation temperature of 25 °C. The SMN 73Ao mutant has been characterised previously [6, 7, 11–14]. The chromosome 2 and 3 deficiency lines were obtained from the Bloomington Drosophila stock center at Indiana University, USA. Deficiency lines were crossed to the SMN 73Ao mutant line to determine whether haploinsufficiency of genomic regions have a negative influence on the adult viability of SMN 73Ao heterozygotes. Adult viability was calculated as the percentage number of adult flies eclosed divided by the expected number for the cross. For deficiencies that were found to depress adult viability, the cross was repeated for confirmation. Genes mapped within the SMN 73Ao -interacting chromosome deficiencies were listed using the ‘CytoSearch’ query tool on FlyBase  (http://flybase.org; FB2017_02 release). The ‘HitList’ tool was applied to the gene set to analyse the frequencies of values for gene ontology (GO) controlled vocabulary (CV) terms for biological process. GO enrichment analysis using the PANTHER classification system was performed using the enrichment analysis tool on the gene ontology consortium (GOC) website (http://geneontology.org). The FLP-DFS (yeast flippase-dominant female sterile) technique (reviewed in ) was utilized to generate SMN 73Ao mutant germline clones. Virgin females having the w; SMN 73Ao FRT2A/TM3, Ser genotype were crossed to y w hsFLP; ovo D1 FRT2A/TM3, Ser males and recombination between the FRT (flippase recombinase target) sites in the resulting progeny was stimulated through heat-shock at 37 °C for 1 h at day 3, 4, and 5 after egg hatching. Egg chambers that survive beyond stage 4 in the ovaries of the female offspring (y w hsFLP; SMN 73Ao FRT2A/ovo D1 FRT2A) lack ovo D1 and are hence homozygous for SMN 73Ao . Ovaries were dissected in PBS (phosphate buffered saline) and later fixed in 4% paraformaldehyde in PBS at room temperature. Following treatment with proteinase K, ovaries were washed in PBS + 0.1% Tween20, re-fixed and washed again. They were later washed in a 1:1 solution formed of PBS + 0.1% Tween20: hybridization buffer (50% deionized formamide, 5× saline sodium citrate, 100 μg/ml E. coli tRNA, 50 μg/ml heparin, and 0.1% Tween20 in DEPC-water). Following pre-hybridisation for at least 1 h at 55 °C in hybridization buffer, DIG-labelled antisense gurken or oskar RNA probes were allowed to hybridise overnight in the same conditions. Three washing steps at 65 °C using (a) hybridisation buffer, (b) 1:1 PBS + 0.1% Tween20: hybridisation buffer, and (c) PBS + 0.1% Tween20 in that order, preceded incubation with sheep anti-DIG HRP-coupled antibody (1:2000; Roche Diagnostics Ltd.) for 2 h at room temperature. The hybridisation signal was amplified with Cy3-tyramide (PerkinElmer) and the ovaries were counterstained with Hoechst 33342 prior to mounting. Confocal images captured using the oil 40× magnification objective were processed using the ImageJ software (National Institutes of Health, Bethesda, MD, USA). Based on oocyte size and distinct mRNA localisation patterns, assessment was restricted to early stage 10 egg chambers. To gain insights on pathways involved in SMA, we attempted at conducting a pilot genetic screen using part of the Bloomington Deficiency Kit. The Kit provides maximal coverage of the Drosophila genome with a minimal number of molecularly-defined deletions, hence facilitating genome-wide genetic screens . Our screen involved a single stage designed to identify deletions that induced a pronounced decrease in adult viability when placed within an SMN loss-of-function heterozygous background. Previous studies suggested a strong association between the degree of adult viability and motor dysfunction phenotypes . SMN 73Ao /TM6B virgin females were mated to males carrying deletions spanning either arm of chromosome 3 (3R/3L) or the left arm of chromosome 2 (2L), hence, targeting approximately 50% of the Drosophila genome. 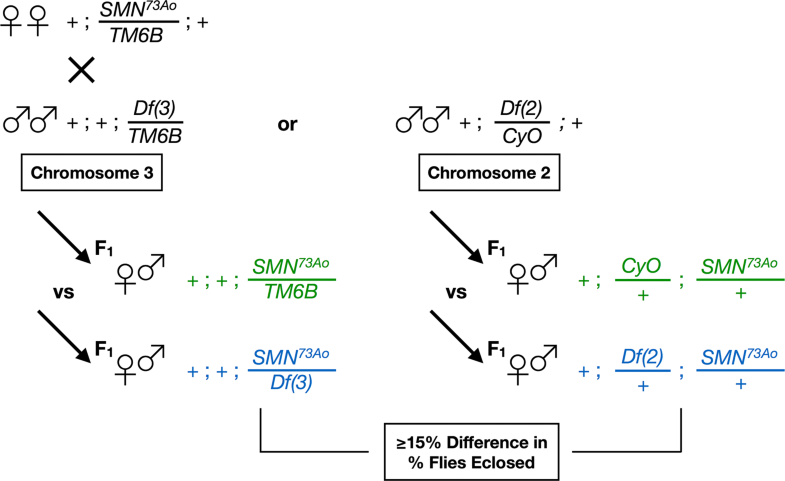 In the F1 generation, flies of the appropriate genotype were identified to determine whether deletions placed in trans with the SMN 73Ao chromosome induced reduced viability compared to flies having the SMN 73Ao chromosome only (Fig. 1). The percentage number of flies eclosed was calculated and deletions were defined as ‘enhancers’ if they induced ≥ 15% difference, with the interaction strength being classified as mild (+, ≥ 15%), moderate (++, ≥ 25%), strong (+++, ≥ 35%) or intense (++++, ≥ 45%). In total, 128 chromosome deficiency lines were evaluated and 12 (9.4%) were found to consistently depress the viability of SMN mutant heterozygotes (Table 1; Additional file 1: Table S1). The Df(3L)81k19 deletion on the third chromosome produced the strongest enhancement, thereby leading to no adult viable flies. This was expected since one of the genes covered by the deficiency is the SMN gene, hence, Df(3L)81k19 unsurprisingly failed to complement the loss-of-function SMN 73Ao mutation. Systematic evaluation of the candidate genes located within the genomic intervals flagged by the enhancing deletions is a laborious endeavour without a guarantee of success considering that more than one gene might be responsible for the enhanced phenotype. We therefore generated a ‘HitList’ formed of the genes uncovered by the enhancing deletions and probed the gene set for GO enrichment. Results were not statistically significant but some of the most frequent GO terms for biological process are pathways known to be disrupted in motor neuron disease including oxidation–reduction, neurogenesis, proteolysis, transcription, and translation  (Additional file 2: Table S2). Interestingly, all the identified deletions with the exception of one (Df[2L]ed1), harboured genes that were previously found to modify SMN mutant phenotypes [7, 10]. In addition to validating the design of our screen, this finding can potentially flag genetic loci that overlap independently-conducted genetic screens. In this regard, we found a common thread running through 3 enhancing deletions. Each cover a previously identified genetic modifier that is known to have a role in post-transcriptional regulation of mRNAs that are crucial for determining the axes of the oocyte and future embryo . The genes include encore (enc) covered by Df(3L)HR119, Syncrip (Syp) covered by Df(3R)BSC43, and hephaestus (heph) covered by Df(3R)B81 (Table 1). Specifically, either gene was found to be required for the localisation of gurken and/or oskar mRNAs in oocytes [20–22]. Notably, considering the gene set uncovered by our genetic screen, oogenesis was also identified as one of the top-ranked most-frequent GO terms for biological process (Additional file 2: Table S2). The studies that have thus far explored a role for SMN in oogenesis have been few. Lee et al. showed that defective nuclear organisation was the most prominent early defect in SMN mutant Drosophila eggs. We have previously observed similar phenotypes in egg chambers mutated for the SMN-associated DEAD-box helicase, Gemin3 [23, 24]. Considering our assessment of the genetic screen results, we asked whether SMN is also required for the correct localisation of gurken and oskar mRNAs. To this end, we find that in SMN 73Ao mutant oocytes, gurken mRNA was partially mis-localised, with transcript localisation skewed towards with the anterior or dorsal side (Fig. 2). This is in contrast to control oocytes in which gurken mRNA was always found tightly localised in a dorsal-anterior cap above the oocyte nucleus. Localisation of oskar mRNA was also defective. By the end of stage 8 of oogenesis, oskar mRNA accumulates in a crescent that is tightly localised to the posterior of the oocyte. In SMN 73Ao mutant oocytes, posterior oskar mRNA was only faintly detected (Fig. 2). Overall, these results extend the role of SMN in oogenesis by identifying a requirement for mRNA localisation. In vivo studies have been supportive of a role for the SMN complex in snRNP assembly, hence, disturbances in this pathway and the consequential transcriptome abnormalities are thought to be the primary drivers of the progressive neuromuscular degeneration underpinning SMA (reviewed in ). In particular, we have previously shown that, in Drosophila, perturbation of snRNP assembly factors results in motor defects that mirror those described on loss of SMN or the Gemin constituents of the SMN complex [25–28]. Here, we exploited the genetic tractability of the fly system to identify genetic loci that influence SMN activity, thereby aiming at uncovering novel insights on SMN function in vivo. Thorough mining of the gene set uncovered by the SMN lethality-enhancing deletions allowed us to flag genes with a common function in RNA transport that were ‘hits’ in previous genetic screens. Making use of the extensively-studied Drosophila ovary, these findings led us to show that RNA transport is defective in SMN mutant oocytes. Although such phenotypes do not exclude a role for SMN in snRNP assembly, our results provide in vivo evidence implicating a function for SMN in RNA transport. This is corroborated by in vitro studies that are indicative of an involvement of SMN in mRNA trafficking within neurons (reviewed in [4, 29]). Our study also extends the requirement of SMN during oogenesis. Hence, in addition to nuclear organisation and maintenance of the structural integrity of RNP bodies [11, 30], SMN is also crucial for the cytoplasmic localisation of mRNA transcripts that specify the future embryonic body axes. It is highly likely that the evident mislocalisation of gurken and oskar mRNAs contribute to the embryonic death observed for oocytes derived from an SMN mutant germline . Our findings corroborate those by Grice and Liu  who showed that SMN 73Ao homozygous mutant neuroblasts failed to correctly localise the RNP component Miranda at the basal membrane. The exact function of SMN in mRNA trafficking remains unclear. Similar to its role in snRNP assembly, SMN might act as a molecular chaperone for the assembly of mRNP complexes . 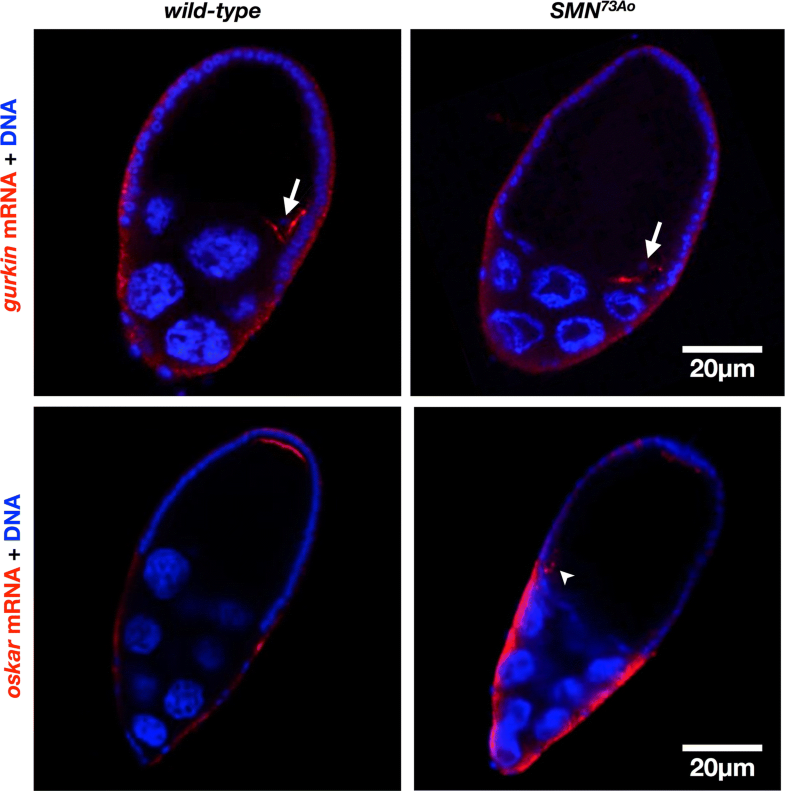 The Drosophila ovary can however serve as a model system to further investigate the in vivo function of SMN in mRNA transport and localisation. Such studies can potentially provide insights on parallel activities occurring within the neuromuscular system and whose perturbation can lead to SMA. Limitations arise from the lack of systematic evaluation of all the candidate genes covered by the enhancing deletions. In this regard, the contribution of previously identified genetic modifiers to the enhancing effect of the deletions is tentative. Study design: RJC. Experimentation: BA, RJC. Data analyses: BA, RJC. Manuscript composition and editing: RJC. Both authors read and approved the final manuscript. The authors thank Matthew Camilleri and Zillah Deussen for technical support. They are also grateful to Marcel van den Heuvel for fly stocks and critical discussions. Data available on request from the corresponding author. Work on SMN in the authors’ laboratory is supported by the University of Malta Research Fund, and the Malta Council for Science and Technology Internationalisation Partnership Award. 13104_2018_3496_MOESM1_ESM.xlsx Additional file 1: Table S1. Chromosome deficiency lines evaluated in the SMN enhancing screen. 13104_2018_3496_MOESM2_ESM.xlsx Additional file 2: Table S2. Most frequent Gene Ontology (GO) terms for ‘biological process’ of genes covered by SMN 73Ao enhancing chromosome deficiencies. GO terms are ranked in descending order with #1 = most frequent and #14 = least frequent.